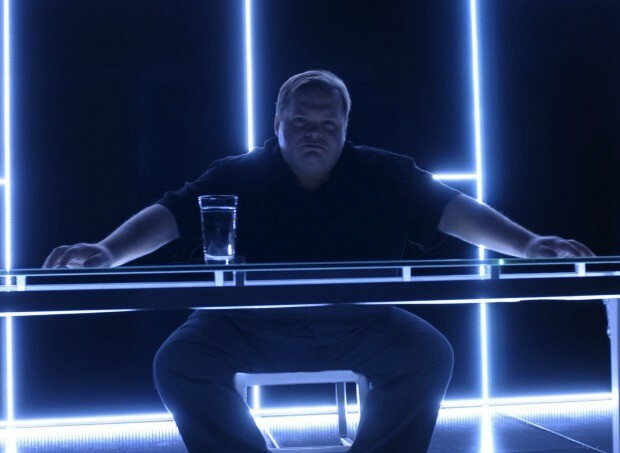 Master storyteller Mike Daisey’s one-man-show “The Agony and The Ecstasy of Steve Jobs” is a theater piece that every Apple fan should see. It’s a laugh-out-loud monologue about the world of Apple, but it delivers an important message: The products we love are made under inhumane conditions. Daisey’s show opened last night for a four-week run at the Berkeley Repertory Theatre (Sunday, January 23 through February 27). Daisey totally nails what it is to be an Apple fan. But then he visits China to find out how the devices he loves are made, and confronts an uncomfortable truth — they are made in sweatshop conditions, frequently by children. Daisey visited China last year to gather material for the show. During his monologue, he describes (hilariously) how he got to talk to lots of workers at Apple’s factories. But the stories they told him weren’t so funny. He talked to kids who were as young as 11 who worked 16 hour days, assembling iPhones and iPads by hand. One worker mangled his hand on the iPad line, but didn’t receive medical treatment for his injuries. He went back to work making iPads but was fired for being slow. Daisey discovers that a lot of Apple’s products are made by hand — because human labor in China is a lot cheaper than building machines. But the humans are treated inhumanely — witness the rash of suicides at the plant. Daisey’s show would be unpalatable if it wasn’t so funny. It’s a roller-coaster ride. He takes the audience up with funny observations about Apple and Steve Jobs, and then delivers some uncomfortable truths about the modern industrial system that is largely invisible to consumers outside Asia. I laughed my head off for two hours, but I left feeling ashamed to turn my iPhone back on. The show is highly recommended. If you’re coming to Macworld this week, head across the Bay to Berkeley (it’s an easy BART ride) and check out Daisey’s show. It’s an eye-opener. The show is unapologetically polemical: Daisey is calling on Apple as an industry leader to improve working conditions at its Chinese subcontractors. An anti-sweatshop stance (somewhat) worked for Nike, now it’s Apple’s turn. If the company can get green in response to consumer demand, the same should be true for the treatment of its assembly-line workforce. Mike Daisey’s “The Agony and The Ecstasy of Steve Jobs” runs at the Berkeley Repertory Theatre through February 27.